LADY SARAH (1979) The 86 foot fishing vessel Lady Sarah sank in the Bering Sea near Akutan October 13, 1979. The crew was picked up by the fishing vessels Sea Wolf and Ocean Leader. LADY SELKET (1994) The 175 ton 87 foot steel crab fishing vessel Lady Selket capsized February 6, 1994 approximately 100 miles NNW of Dutch Harbor in the Bering Sea. She was on her way in from the fishing grounds with a full load of opilio crab. A broken circulation pipe caused the vessel to flood and roll over. After attempts to stop the flooding and pump out water failed, the five crewmembers donned survival suits and abandoned ship to a life raft. They were rescued by the fishing vessel Silent Lady. The derelict hull of the Lady Selket became a hazard to navigation and was sunk by the U S Coast Guard Cutter Rush using 600 rounds of 50 caliber ammunition. LADY SIMPSON (1981) The crabber/trawler Lady Simpson flooded through her stern ramp and sank September 9, 1981 approximately 72 miles north of Dutch Harbor. The crew of six abandoned ship and were picked up 28 hours later by a Japanese trawler. LAURADA (1899) The 1,256 ton 230 foot iron steamer Laurada sprung a leak and was run ashore in Zapadni Bay, St George Island at 11 a.m. September 28, 1899. The Laurada left Seattle September 12th bound for Nome with 18 passengers and 46 crewmen. She was carrying 1,200 tons of assorted cargo including cattle and sheep on deck. After the vessel stranded, the USCG cutter Corwin rescued the passengers and crew. The wreck report states that the cargo was a total loss and the Laurada a total wreck. The vessel was valued at $30,000 with $10,000 worth of insurance. The cargo was valued at $50,000 with insurance for $40,000. LCT-319 (1943) The Navy landing craft LCT-319 ran aground in a storm and sank August 27, 1943 in Kiska Harbor. The Lettie was valued at $4,500 and her complete loss was reported as $5,100 with cargo. The vessel had no insurance but the cargo had an open policy for $600. 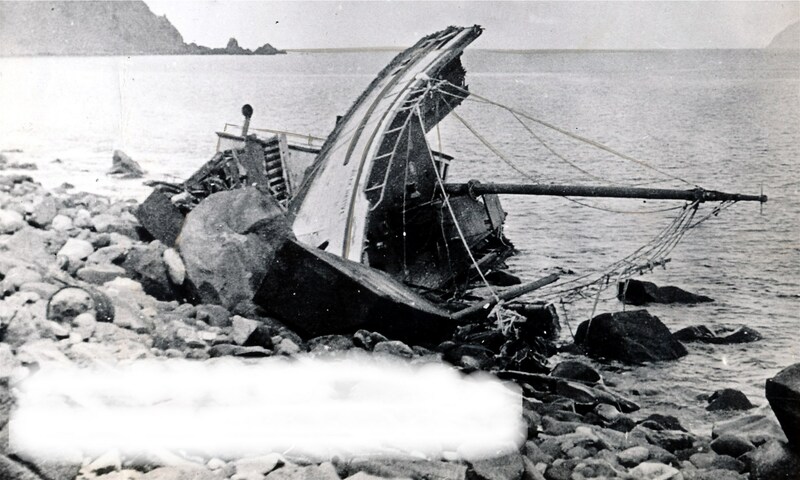 This same vessel was in the news June 18, 1917 when her master, captain L Johannsen, was washed overboard and lost while salvaging equipment from the wrecked cannery ship Saint Francis at Unimak Pass. The vessel had also salvaged a considerable amount of wreckage from the ships Standard and Saint Katherine. A C Goss, an agent for Alaska Commercial Company, took the Lettie over when captain Johannsen was lost. Later in 1917 Goss wrecked the Lettie at Atka Island and he and the crew were rescued. Goss likely purchased the vessel at salvage. LILLIE (1907) The schooner Lillie was wrecked at Unalaska March 30, 1907 and became a total loss. LIN J (1999) The 96 foot crab fishing vessel Lin J was lost with all hands March 18, 1999 approximately eight nautical miles northwest of Saint Paul Island in the Bering Sea. The vessel was thought to have iced up, capsized and sank in the 40 knot winds, ice fog and heavy icing conditions. A submerged pinnacle in the area may have also contributed to the disaster. Lost were skipper Blake Kinnear (50), Jason Conlon (24), Mark Shane Hill (45), John McKerley (39) and Aaron Miller-Moylan, all from Kodiak. LISA JO (1997) The 82 foot fishing vessel Lisa Jo grounded, rolled over and sank February 19, 1997 in Akun Bay, Akun Island. The operator fell asleep precipitating the disaster. There was only one person aboard and no loss of life. LISTER (1922) The 21 ton wooden gas screw Lister stranded and was lost at 3:00 a.m. Friday November 17, 1922. The vessel departed Umnak Island November 16 with four crewmen aboard bound for Unalaska. According to part owner and master of the Lister, F H Larsen of Unalaska, an incorrect compass put the vessel off course in the dark of night. The vessel stranded about 10 miles south of “Cape Makushin” on Unalaska Island. The crew escaped to safety, but the Lister, valued at $4,000 was estimated to be a total loss. She had no cargo save ballast and no insurance. LOCKS (1964) The 43 ton 58 foot wooden oil screw fishing vessel Locks collided with the vessel Fern and was lost September 13, 1964 at Unalaska. LONGLINER (1983) The crab fishing vessel Longliner flooded and sank April 28, 1983 seven miles northwest of Cape Ideluk in the Bering Sea. LORVON (1998) The 50 foot longline halibut fishing vessel Lorvon experienced a structural failure of the bow in heavy seas, flooded and sank May 16, 1998 on the northeast side of Umnak Island two miles east of Cape Tanak. All three crewmembers abandoned ship to a life raft and were rescued by the fishing vessel Heritage. LOU-ANN-MARIE (1996) The 32 foot fishing vessel Lou-Ann-Marie burned and sank August 9, 1996 approximately 120 nautical miles northwest of Dutch Harbor. All three crewmembers were rescued. LOUIS WALSH (1902) The 1433 ton ship Louis Walsh broke loose from her moorings in a gale and wrecked near Dutch Harbor in 1902. The ship was washed ashore on the Dutch Harbor spit where she sat high and dry. The hull was stripped and eventually broke up. The Louis Walsh was built in Bath, Maine in 1861. LOUISE (1991) The 86 foot fishing vessel Louise sank in rough weather near Dutch Harbor November 7, 1991. Four crewmembers were rescued and one was lost. The Lister sank traveling from Umnak to Unalaska, “about 10 miles south of Unalaska Island” according to the wreck report filed by her master. Though it is possible that she sank in the area you mention, there were many other vessels lost in the vicinity that may have had square ports. The Eliza Anderson of 1898, Fearless of 1901, Thornton of 1886, Lewis Walsh of 1902, Mermaid of 1899 and Bender Bros. of 1907 were all wrecked near Dutch Harbor and are possible candidates, although the last two were later salvaged. With only one piece to the puzzle, the possibilities are endless. It could be someone was using that piece of metal to weight down a ground line for fishing halibut or something completely unrelated to a wreck.